His novel was praised for its "complex literary wonders." Author Michael Redhill celebrates winning the 2017 Giller Prize for his novel "Bellevue Square" in Toronto on Monday. 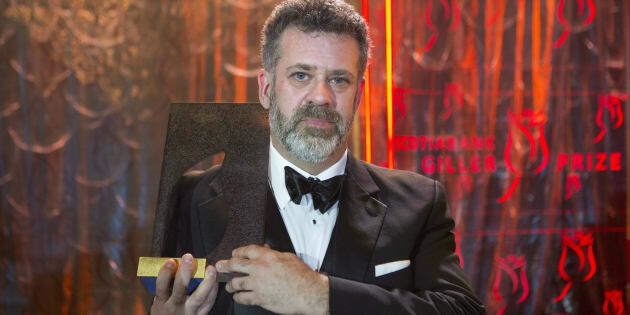 For more than a decade now, Toronto author Michael Redhill has been publishing mystery novels under the pseudonym Inger Ash Wolfe, but on Monday it was a piece of literary fiction bearing his actual name that won the $100,000 Scotiabank Giller Prize. The thriller "Bellevue Square'' (Doubleday Canada), about a woman on the hunt for her doppelganger in a multicultural neighbourhood of Toronto, was praised by jury members for its "complex literary wonders'' as it nabbed the prestigious honour. Redhill seemed shocked as he accepted the prize and gave a tearful speech thanking his supporters as well as the late businessman Jack Rabinovitch, who founded the Giller Prize in 1994 in honour of his late wife, literary journalist Doris Giller. "I was a little more emotional than I was expecting to be — but life doesn't prepare you for receiving a $100,000 cheque and then addressing people live across the nation, so I think I will probably have no memory of this evening in about 20 minutes, just to protect myself,'' he said with a laugh in an interview after the awards ceremony. Author Michael Redhill celebrates winning the 2017 Giller Prize for his novel "Bellevue Square " in Toronto on Monday. Redhill beat out titles by Eden Robinson, Rachel Cusk, Ed O'Loughlin and Michelle Winters, who each get $10,000 for being finalists. He started out as a literary writer, poet and novelist but branched out in the mystery genre in 2006. "Bellevue Square'' was inspired by the things he learned when he was a mystery novelist and centres on a park in Kensington Market that "is a strange kind of clearing house for humanity,'' he said. "It's been 11 years since I published a book under my own name, so it's fun to come out again,'' said Redhill, who was born in Baltimore, but grew up in Toronto. In his acceptance speech, Redhill gave a toast to Rabinovitch, who died in August at age 87. This year's gala, the 24th annual one, also commemorated him at the start of the show. Opera star Measha Brueggergosman gave a powerful performance of Leonard Cohen's "Hallelujah'' with a choir while photos of Rabinovitch, his family and friends were projects on screens beside the stage. "Jack would have been thrilled, as he always was, to be here surrounded by friends with whom he had deep, loving relationships, and in the company of authors he greatly admired,'' his daughter Elana Rabinovitch, the Giller's executive director, said before the televised show began. Comedy star and author Mary Walsh hosted the black-tie gala, which was broadcast on CBC-TV from the Ritz-Carlton Hotel in Toronto. Other guests included actor Wendy Crewson, filmmakers Atom Egoyan and Patricia Rozema, Ontario Health Minister Eric Hoskins, and literary stars John Irving and Lawrence Hill. This year's jury read 112 books submitted by 73 publisher imprints from across the country. The jury included Andre Alexis, Anita Rau Badami, Lynn Coady and Richard Beard. Redhill said "Bellevue Square'' is the first in a tryptic of novels and he's already most of the way through writing the second one.